मेरे गमों का इलाज भी कितना सस्ता है..
On sharing them you can unburden your heart. So choose the finest collection from here and share them on your social networks. You can share Sad Shayari on whatsApp, Facebook, Instagram or any other social network. Sad Shayari is the most trending topics all over the world. 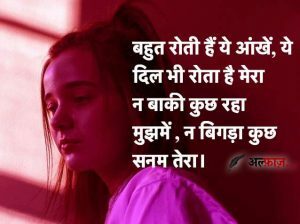 Every lover wants to share his/her sadness through sad poems, sad sms or Sad Shayari. If you are one of them and looking for such type of quotes then you are on the right place. Someone breaks our heart and that time we feel sad. And that time we go to listen sad songs, read poems and Sad Shayari. 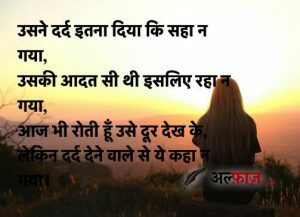 Our team is going to share Bewafa Shayari or Breakup Shayari on this page for every broken heart.